The Downtown Hoedown is an annual country music festival that features some of the best artists in the industry. It is three days long, drawing thousands of country music fans into the city each year. In the past, huge stars, including Reba McEntire, Garth Brooks, and Big & Rich, have performed. Stop by this year to see some of the biggest names in country music, as well as many up and comers ready to take the country world by storm! 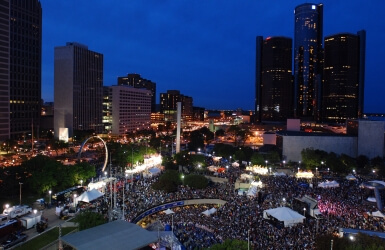 If you're a fan of country or bluesgrass music, you can't go wrong with a visit to the Hoedown in Downtown Detroit. There's always an amazing lineup to enjoy, and each year the festival gets bigger and bigger. Not only is there great music to witness, but there are carnival rides, great food, shopping, and souveniers, as well as activities for the children. When you're planning your excursion to the Hoedown, you can bet that a professional limousine or party bus will allow for the best transportation experience possible. After all, who wants to deal with the crazy traffic of the Hoedown by themselves? Let a professional chauffeur take care of the designated driving as you party and enjoy the night how it should be enjoyed. A limousine or party bus is all it takes!